An amber colored twig ant poses by an amber ring (Pseudomyrmex pallidus). Ran across a few members of this small species of twig ants nesting in some hollow willow twigs near my home. 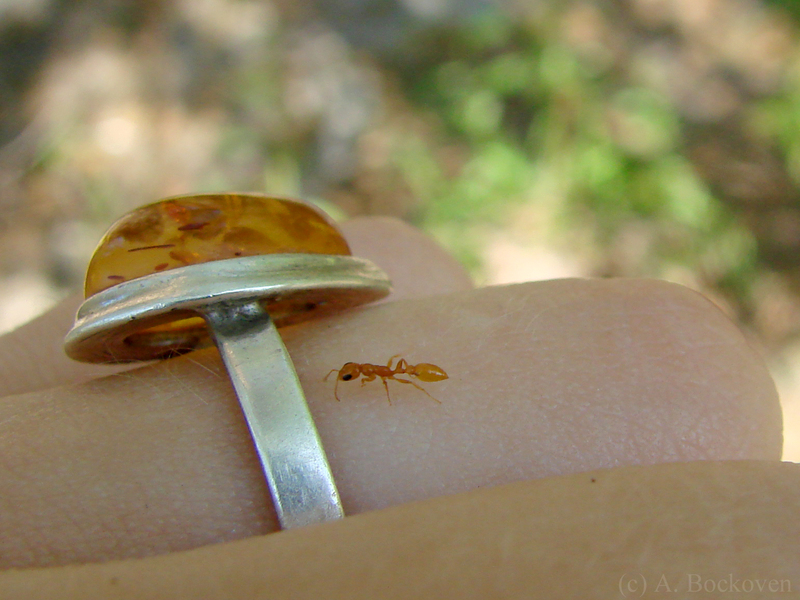 The little workers were so fast I only managed to snap one decent photo–the above picture where the honey colored ant showed off how well she matched my amber ring. 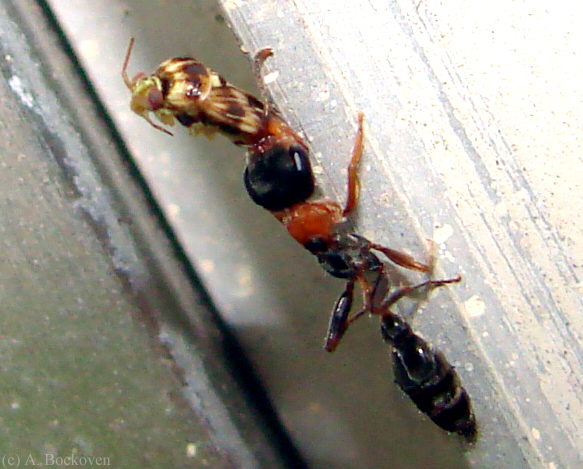 Pseudomyrmex ants are easily distinguished by their long narrow bodies and wasp-like appearance. The most common local species is the elongate twig ant (Pseudomyrmex gracilis) a large-bodied ant with distinct black and red coloration. By contrast, P. pallidus is tiny and delicate, with a characteristic amber coloration. Like other Pseudomyrmex, the small colonies of P. pallidus nest in stems and twigs. Twig-popping, or the snapping of dead tree stems, is an ant hunting technique that was recently recommended to me, and it has been fun to see what turns up. Elongate twig ants (Pseudomyrmex gracilis) carrying food to the nest. More pictures from the Pseudomyrmex colony that nested in my window lining last spring. The workers above posed nicely on the window glass as they all tugged on a bit of food. Normally the workers of Pseudomyrmex colonies tend to forage independently, relying on their speed, size, and potent sting to bring down prey and haul it back to the nest alone. However, in this case, the haul in question apparently attracted the attention of some other workers. People tend to think of ant colonies as perfectly synchronized machines, operating in perfect unity. 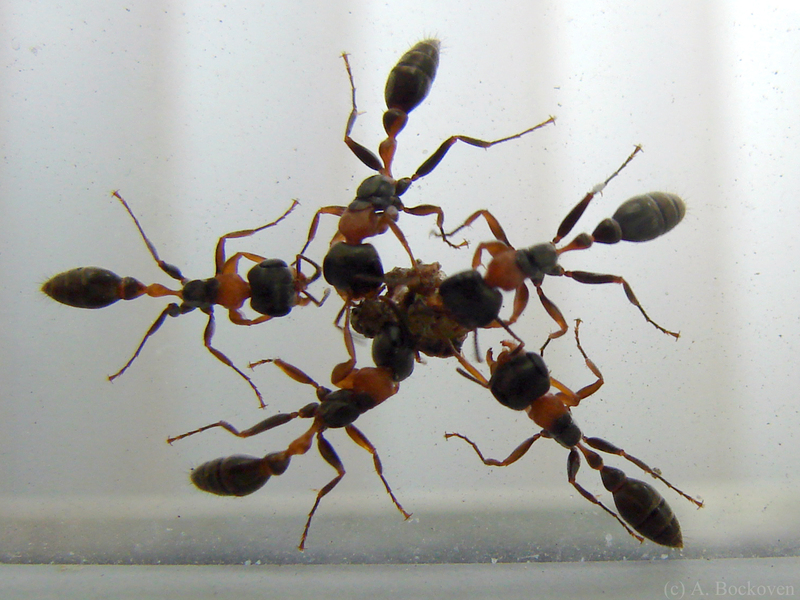 However, anyone who has actually watched a group of ants attempt to maneuver a large prey item down a small nest entrance will have noticed that it’s more like a game of tug-of-war, with hopefully most of the pieces deciding to pull in the appropriate direction. The same sort of ‘rule-by-majority’ principle applies to any number of colony processes, such as selection of a nest site. I have personally watched a group of acrobat ant workers purposefully hauling larvae to a new nest location, while a second group of workers diligently hauls them right back, passing each other on the way. They’ll also drag the queen along if she doesn’t cooperate. 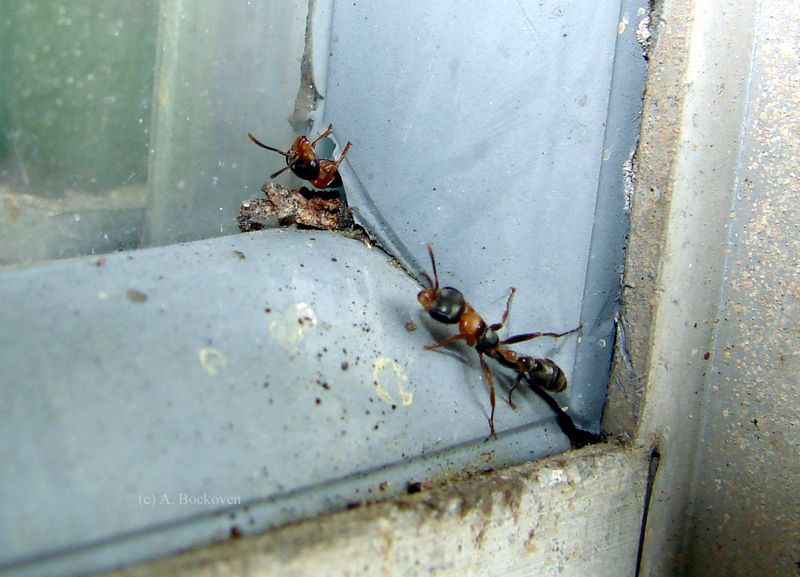 A twig ant worker (Pseudomyrmex) removing trash from windowsill nest. Last spring I had the pleasure and entertainment of some of my favorite ants setting up camp in the exterior lining of my front window. Pseudomyrmex is one of the groups of ants that truly displays the close relationship to wasps in their form. I have never been stung, but I’m told it’s fairly painful. 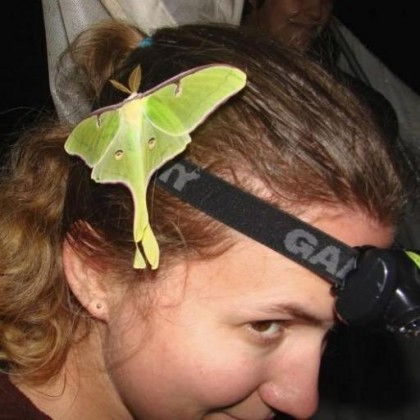 Luckily, like many insects, they are not particularly aggressive towards humans unless truly provoked. In general these ants responded to my getting too close with the camera by dropping off the wall to the ground, a fairly common escape behavior. It was fun to watch the workers as they hauled home their catches and try to identify the prey item. A twig ant (Pseudomyrmex) preys on a plant bug (Miridae). Mirids (Miridae), commonly(and rather vaguely) known as ‘plant bugs’ were all over the place at the time, and seemed to be a fairly common catch. My personal favorite was the small critter seen below, whose large curved jaws identify it as a neuropteran larvae, one of the net-winged insects. It’s likely a lacewing larvae, but–as a number of antlions had set up pits in the sand below the window–I am personally fond of the idea that this is a case of ant eating antlion. Sweet revenge! A twig ant returning to the nest with its neuropteran prey. 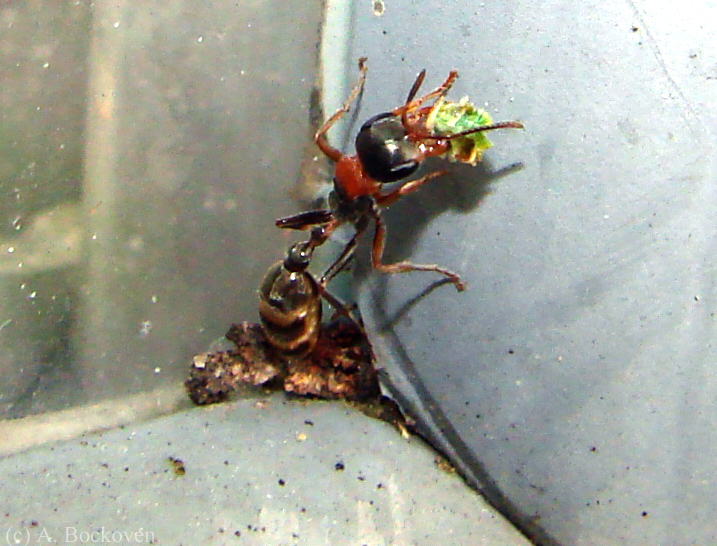 A carpenter ant worker (Camponotus) raids a Pseudmyrmex pupa from an opened nest. While watching Pseudomyrmex workers in an opened nest carry brood to safety (see previous post) I noticed one ant that didn’t belong. Above you can see a carpenter ant worker who has taken advantage of the confusion to steal one of the helpless juveniles. Although some species of ants practice brood-raiding in order to aquire ‘slave’ ants, this unfortunate Pseudmyrmex pupa will merely make a tasty meal. I accidentally opened up this nest of Pseudmymex ants in Argentina while trying to see where a worker carrying a caterpillar had got to. This promoted a flurry of activity as workers grabbed brood to carry to safety. The pale white ants are, in fact, immobile pupae (the equivalent of a cocoon or chrysalis in a butterfly) getting ready for their final molting into active adults. You can see one dark pupa that is nearly ready to eclose. 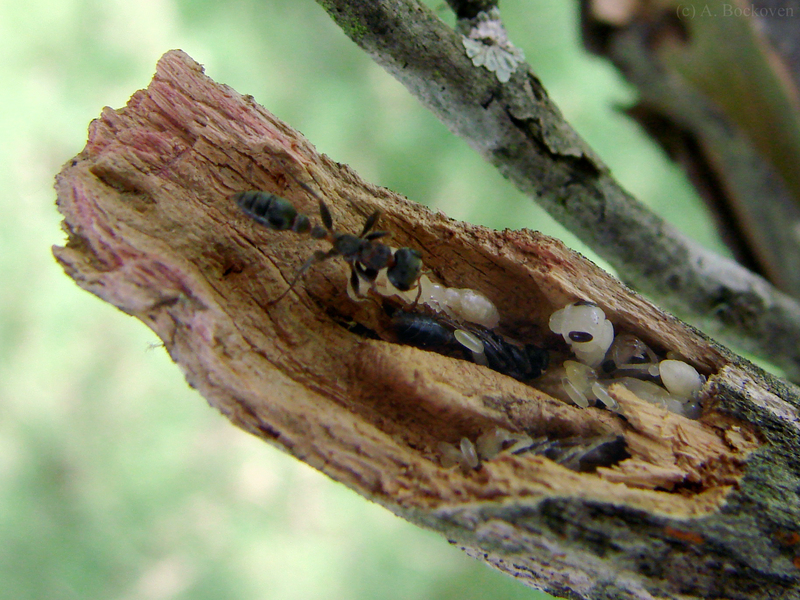 The small white objects are eggs, but no larvae appear to be present in this portion of the ant nest. Ant larvae look a bit like small grubs or maggots. 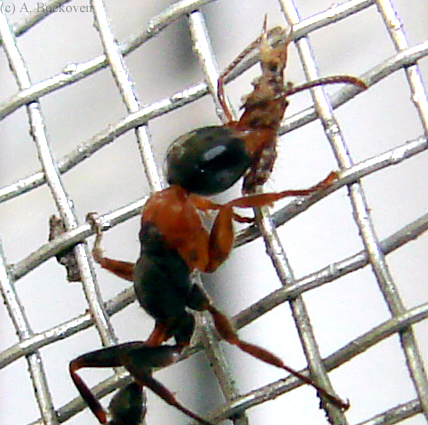 Pseudomyrmex are occasionally called twig ants. The genus name, Pseudomyrmex, means “false ant,” because the original descriptor of this genus thought he had discovered an ant-like wasp. Pseudomyrmex are very interesting ants. Fairly large, if slender-bodied, manyPseudmyrmex species live in relatively small colonies (often only 30 to 80 individuals, compared to the hundreds of thousands seen in species like fire ants). 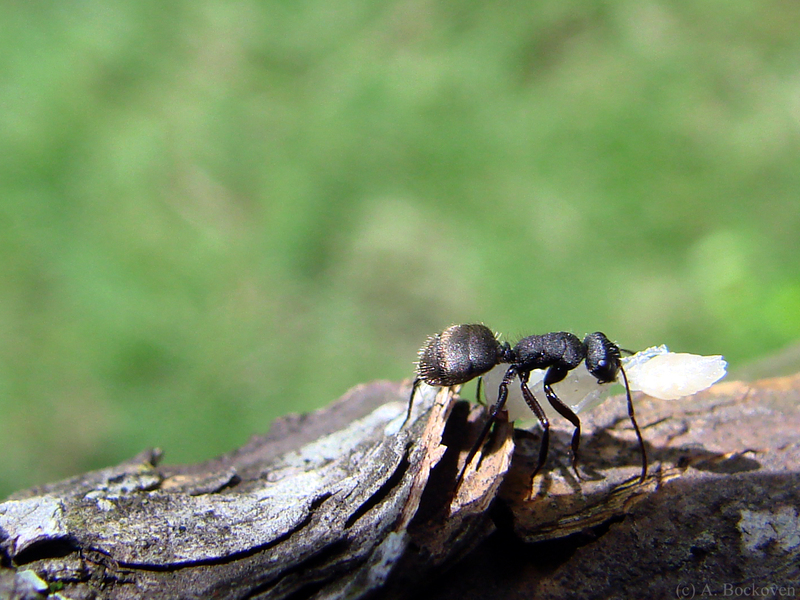 Individual workers forage alone, able to take down prey and return it to the nest without assistance. Personally, I call these ants tiger ants–fierce, sleek, and deadly solo hunters. These ants also include the acacia ants, and other tree symbionts, whose colony sizes can number in the millions. In these mutualistic systems the tree provides the ants with specialized food and nesting space and the ants fiercely defend the trees.